A fun and easy way for you and your little ones to add some green to your diet is smoothies! Below are three tasty recipes for the whole family enjoy. A blender is required to make these recipes. 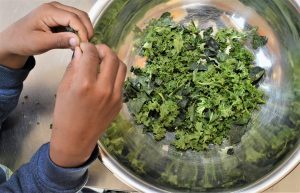 Wash greens, and ask kids to tear leaves into small pieces. Add all ingredients into the blender. Blend well. Tightly pack 2 cups of spinach in a measuring cup and then toss into blender. Add water and orange juice, and blend until all leafy chunks are gone. Add the yogurt, strawberries, and banana. Blend until smooth. Add all ingredients into the blender. Blend well. Taste and honey, if desired. My enthusiasm for sustainable food systems and nutrition education has taken me from Northern California to Brooklyn, NY to Greensboro, NC and many other places in between! I love to interact with people of all ages, backgrounds and cultures, and I get to do this each week in the ESY kitchen. I have degrees in nutrition and public health from UC Berkeley and UNC Chapel Hill, and I am a proud Registered Dietitian. Outside of work, I’m an avid distance runner and I love to explore new places with my own two feet. Contact me at mdavis@gcmuseum.com.